Will we stand by and lose our national sovereignty? 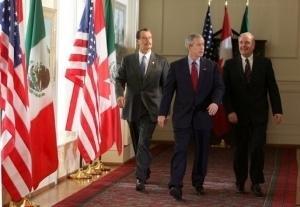 March 2005 -- President Bush walks with Mexican President Fox, left, and Canadian Prime Minister Paul Martin at the Waco, Texas summit at which the Security and Prosperity Partnership was inaugurated. Despite the ongoing disastrous NAFTA-related trade deficits, and the overall failure of North American "integration" to bring increased prosperity, there is a seemingly never-ending push by elites to continue advancing this agenda. With the media granting immunity from virtually any revealing reportage on the subject, industry and government elites cleverly, stealthily, and incrementally advance their cause of "harmonizing" the trade, immigration, transportation, and security policies of Mexico, Canada, and the U.S. Given the hitherto sleepy and unresponsive American public, it seems possible that these changes will be realized. And if they are, they will be revolutionary, and most probably, the beginning of an EU-like super state. After all, there is a dynamic that occurs when one tries to extensively harmonize the policies of different neighboring nations -- at a certain point it is simply easier to merge the different government structures into one. But in the eyes of some leading industry CEOs, a supranational entity will be a more effective global competitor for energy resources and more competitive in world commerce. In carrying out your instructions, we established working groups under both agendas of the Partnership - Security and Prosperity. We held roundtables with stake holders, meetings with business groups and briefing sessions with legislatures, as well as with other relevant political jurisdictions. The result is a detailed series of actions and recommendations designed to increase the competitiveness of North America and the security of our people...Upon your review and approval, we will once again meet with stakeholders and work with them to implement the workplans that we have developed. We will also encourage them to continue to provide us with new ideas and proposals which will help shape our forward agenda and our vision for North America...We recognize that this Partnership is designed to be a dynamic, permanent process and that the attached workplans are but a first step. Shortly after the release of this report, the three North American governments announced the creation of the North American Competitiveness Council (NACC). 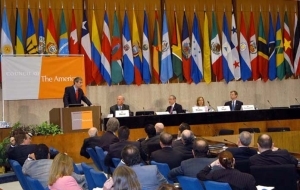 Composed of 30 major corporate leaders, 10 from each country, the NACC is a subcommittee of the private Council of the Americas. This umbrella group is a "business organization whose members share a common commitment to free trade and open markets throughout the Americas." The NACC publicly casts its role in the SPP process as advisorial. Their web site mentions that its role is to take the overall SPP agenda and advise which of its elements are "a real priority". But the Council of Canadians, a group opposing the SPP, suggests that the NACC plays a major role. They quote U.S. Secretary of Commerce Gutierrez announcing that, "the priorities" the NACC identifies "will set the stage for our work going forward in the SPP". Whatever the role of the NACC, it appears to have more of a role than the elected members of the U.S. Congress -- they have no apparent participation in supervising or restraining the developments of the SPP, nor have they authorized the SPP. This highlights that, if the SPP does lead to major changes in governance, those changes are now developing in a way that contrasts with the philosophy of our founding fathers. They believed in Constitutional Conventions, with elected delegates representing the people. A similar process still exists for amending the U.S. Constitution. But with the SPP agenda, Conventions seem to have been replaced with working groups, and instead of delegates we have unelected "stakeholders" representing elite members of the corporate community. This begs the question, does the average citizen deserve the respect of being considered a stakeholder? The stealthiness of the approach should raise alarm. If the SPP is really no big deal, then why isn't there much open discussion about it? Of course, anything that would entail major constitutional change could provoke a major reaction from a people submerged in a culture that, at least superficially, extols the virtues of American independence. For this reason, the surreptitious approach of the SPP movement suggests the worst case -- that the end-goal is major structural change in U.S. governance. A similar culture of attachment to independence still exists in Great Britain, where the outgoing Prime Minister Tony Blair "welcomed controversial plans to bring back the troubled EU constitution by the back door - totally bypassing the need for public referendums on sweeping new powers for Brussels", according to the Daily Express. The Express goes on to mention that, "German chancellor Angela Merkel has suggested ditching the name 'constitution' from the title and instead calling it an 'amending treaty' - to avoid having to seek the approval of voters". The SPP agenda is already on the Blair-Merkel track -- it is actually an outgrowth of NAFTA. According to the Department of Commerce "The SPP is built on the North American Free Trade Agreement ...."
It is clear from public documentation that those working at the ministerial level in the U.S., Mexico, and Canada consider the SPP process to be a "permanent" and irreversible one. This is not language typically used to describe a treaty which is open for future reconsideration. It is alarming to observe that the SPP's agenda items are in-line with radical proposals by the Council on Foreign Relations, detailed in its report, "Building a North American Community." According to the Forward, the report is "a detailed and ambitious set of proposals that build on the recommendations adopted by the three governments" at the SPP inaugural summit in Texas. This report is clearly the CFR's vision for what the SPP should evolve into, and it was released almost immediately after the SPP was launched. It recommends the establishment of a trilateral "North American Community" by 2010. Normally, a report from a think-tank would not be a big deal. But consider the credentials of the 36 influential task force members who crafted it. For the most part, they represent prominent people who have held positions at the highest levels of the executive branches of national or regional governments in all three nations. The important thing to realize is that accomplished people of this rank do not spend time working on projects if they see little hope of success. So we can bet that their professional opinions are that their proposals have a significant chance of being realized. Creation of a "common economic space"
To enhance security, a "more open border"
Promote open skies and open roads, thereby allowing Mexican and Canadian transporters to haul freight and passengers between destinations in the U.S.
Increase labor mobility -- Canada and the U.S. should consider eliminating all restrictions -- it is hoped that this policy could be eventually extended to Mexican labor. A North American Advisory Council, which would be an independent body of advisors composed of eminent persons from outside government. To complement this, private bodies "along the lines of the Bilderberg" conferences could be established. 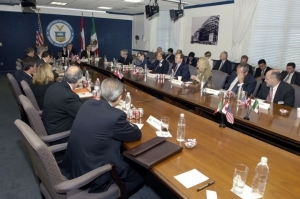 A North American Inter-Parliamentary Group to help coordinate the work of the U.S., Mexican and Canadian legislatures, with the corporate CEOs of the North American Advisory Council providing the agenda. What we know is that the SPP does not contradict this CFR agenda, and in matters of transportation and border issues, it tends to conform to it. This is one sign that the agenda is underway, but there are others. The President's strange resistance to securing the southern border and favoritism of amnesty is one sign, while others are the annual summit meetings held between the chief executives of our nations, and private sector meetings of prominent persons, under the auspices of the North American Forum. 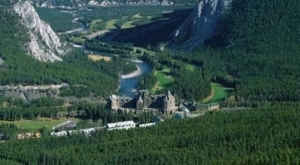 An outside view of the remotely situated Fairmont Banff Springs Resort, in Alberta, Canada, were the North American Forum was held under a media blackout. 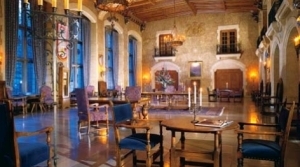 Last year's 3-day North American Forum, held in the remote resort of Banff, in Alberta, Canada, was co-chaired by former U.S. Secretary of State George Schultz, former Mexican Finance Minister Pedro Aspe (one of the CFR task force's cochairmen), and former Alberta premier Peter Lougheed. What little we know about it suggests that the CFR's desire to transform NORAD into a "land, naval, and air defense command for ... North America" was probably brought up. According to the Council of Canadians (COC), the event was kept low-key, with no announcements to the media. Information received through an Access to Information request to the Canadian government indicated that "participants were instructed to avoid direct media engagement." The COC received a leaked "draft" copy of the agenda, which indicated a focus on Energy and Security strategy, as well as other miscellaneous issues. Secretary of Defense Rumsfeld was listed as the keynote speaker prior to a session on "military-to-military cooperation", which had former U.S. Defense Secretary Perry and Admiral Tim Keating, Commander of NORAD, as panelists. According to the COC, Canadian Defense Minister Gordon O'Conner also attended. More leaked information showed who had confirmed their intent to attend prior to the event. The listing was an impressive array of high ranking U.S. and Canadian military and civilian government leaders, and Mexican government and civilian leaders, as well as ambassadors. Despite the relative secrecy, all this leaves little doubt that the event was tailored to a serious purpose related to military integration and/or cooperation between the U.S. and Canada, as well as North American trilateral integration of other forms. This integration is being pursued under the mantel of six "areas of critical importance to the trilateral relationship: labor mobility, energy, the environment, security, competitiveness, and border infrastructure and logistics". The Center for Strategic and International Studies (CSIS) is yet another think tank which works to advance this cause, and has been since at least 1985. In 1985, it's working group on U.S.-Canadian Relations produced a report designed to aid the Canadian and U.S. governments in crafting the Canada-United States Free Trade Agreement of 1989. Later, its Canada Project was permanently established in 1992, and as the NAFTA agreement was being debated, it participated by producing studies on the proposed trade pact. CSIS's Mexico project has also been active over this same period, and is partly focussed on "integration of the U.S. and Mexican economies". More importantly, its director, Armand Peschard-Sverdrup, is now heading up the ambitious North American Future 2025 Project (NAFP), which, on September 30th of this year, is expected to report its findings to the "executive and legislative branches of the three governments" on methods for advancing trilateral integration. In keeping with the quiet manner of SPP activity, the CSIS's documentation describing the NAFP was not available on their web site, but was instead archived on the web site of the Council of Canadians, a group which opposes the SPP. It again describes the same old methods of closed door meetings and stakeholders. A short quote says it all: "In order to strengthen the capacity of Canadian, U.S., and Mexican administration officials and that of their respective legislatures to analyze, comprehend, and anticipate North American integration, the CSIS North America Project proposes to carry out a series of seven closed-door roundtable sessions." So will a stealthy movement of egotistical elitists who oppose the philosophy of our nation's founders, and who treat the general citizenry as though they have no stake in the future, succeed in transforming North America? One wonders how 300 million Americans would let that happen. And yet, Americans often act as though they have no interest in the direction of their government. This is really the only reason why the SPP people get away with treating the average citizen as though they are imaginary --because they have failed to take enough interest in the workings of their government to organize themselves around the principles of sound government. If Americans are not to be treated like they are imaginary, they will need to get both real and serious. The people are the majority. If they care enough to work at bearing the responsibilities of citizenship, our constitutional republic, with all its advantages, can be restored. It is time to be proactive, and it is a major mistake to wait for someone else to lead the way. So please start by calling your congressmen, requesting an AFP membership form, and by contributing what you responsibly can to support our outreach efforts.